Ok so let’s get the obvious out the way, this particular 49 Inch Sony Smart TV is not an exact 50 inches (only 49) and will cost you about 800 bucks if you are an Amazon Prime member (if you aren’t it may be a bit more). The Sony XBR has an added plus of being compatible with Alexa for voice control and additional convenience (Alexa device is sold separately however). For all of you techies out there, with the Sony XBR, you can expect a refreshrate of 60Hz (Native), Motionflow XR 24 (Effective), in addition to Direct-Lit LED. As we already mentioned, this TV does have smart functionality and whose dimensions are: 43.6″ x 25.8″ x 3.1″ (TV without stand) and 43.6″ x 27.3″ x 9.4″ (TV with stand). The inputs for the Sony XBR are 4 HDMI (HDCP 2.2/HDMI 2.0a) and 3 USB ports. Additional accessories include: Remote Control (RMT-TX200U), Batteries (R03), AC Power Cord: (Pigtail, US plug type, 2pin, straight shape), IR Blaster (1-849-161-11). The Alexa capability is a pretty awesome feature; it is also incredibly easy to setup and provides an awesome picture for your viewing pleasure (this TV is also perfect for wall mounts as well). It’s a tad bit on the pricey side, for me personally, even with being a 50-inch and you also have to factor in additional money if you want to use the Alexa option. It does work well with various apps (Hulu, Netflix, etc.) but keep in mind that if you have numerous apps open, the TV may lag a little bit. 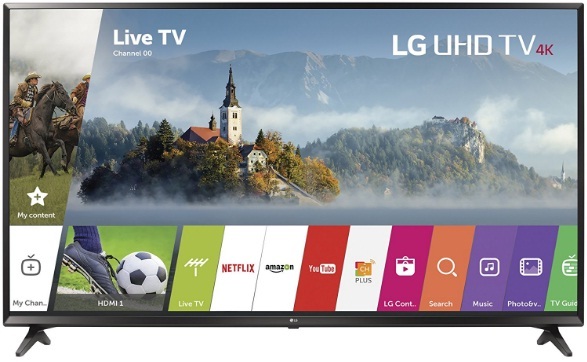 The LG Electronics 49UJ is another 49-inch LED Smart TV, which is significantly cheaper than the one reviewed above, costing about $440.00 on Amazon, so almost half the price. It is built for the most optimal streaming performance and whose features include: dimensions that are 43.7″ x 25.6″ x 3.2″ (TV without stand) and 43.7″ x 27.8″ x 9.3″ (TV with stand). The LG Electronics TV has smart functionality that gives you access to your favorite apps and content using WebOS 3.5 software and Wi-Fi connectivity that is built in 802.11ac. 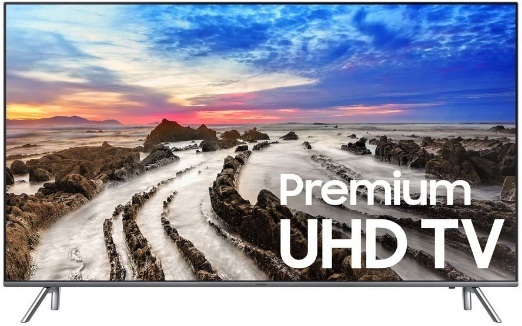 This TV will offer you an ultra HD picture and clarity with the contrast, color, and detail of high dynamic range (HDR) for the most life-like picture possible. Additional features include direct-lit LED picture quality, TruMotion120 with a refresh rate of 60Hz, which allows for fast moving action scenes to be seen with minimal motion blur. Accessories for the LG Electronics TV include 3 HDMI inputs, 2 USB ports, 1 RF, 1 Composite, Component Shared w/ Composite, 1 Ethernet, 1 Optical, and Smart TV Operating System-WebOS 3.5. The picture quality really is amazing and everything you can expect in a HD television; once you get the settings together, it is very easy to setup and is also compatible with wall mounts as well. The price is also pretty awesome as well, you get a great TV for a not-so-bad hit to your wallet. It may take a little bit to get the settings to your liking, so make sure you keep that in mind; and you may also want to turn the Smart Picture option OFF as it can make your picture kind of dull and bleak (which is a bit ironic). 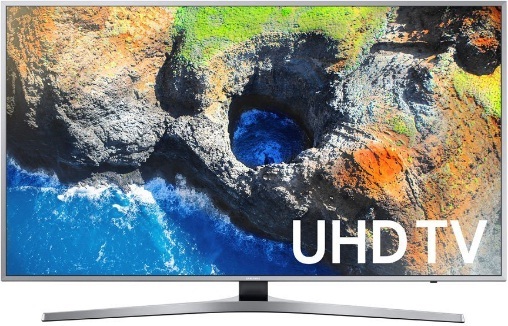 The Samsung Electronics UN49 can be purchased used on Amazon for around $525.00 (if you want to go for the 55-inch, be prepared to pay a little over $100 more). 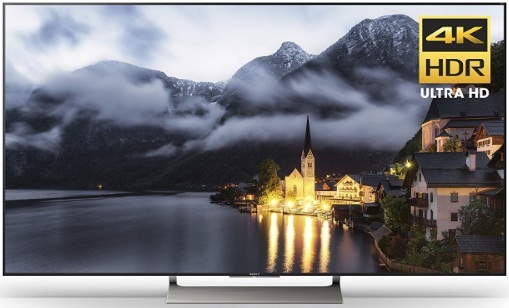 The 4K Color Drive Pro option, that is offered on this particular TV, reveals a wider spectrum of realistic colors, creating a more authentic and optimal picture. The viewer can, and will, see a wider range of color and contrast than full HD with 4K HDR Pro. One remote (which is obviously included) automatically detects and controls all your connected devices and content with no manual programming required, which is a huge plus itself. The ability to have multiple apps on my TV has always been a huge plus for me personally; there truly is just something about the convenience of having all of your favorite shows and apps available at your fingertips. The TV has come delivered damaged a couple of times, or another instance where the screen went completely out only after a couple of months. In cases such as this, I would strongly recommend investing in a solid warranty, even if you may purchase this TV from a different seller. 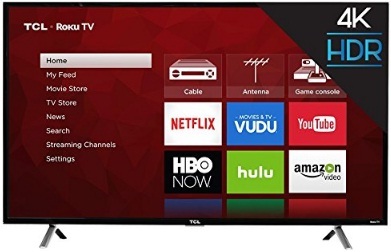 The TCL 48S405 is a Roku Smart LED TV that has smart functionality to get access to over 4,000 streaming channels featuring more than 450,000 movies and TV episodes via the Roku TV option. The dimensions of the TCL are 43.7″ x 25.3″ x 3″ (TV without stand) and 43.7″ x 27.7″ x 8.5″ (TV with stand). The TCL pairs 4K ultra HD picture clarity with the contrast, color, and detail of high dynamic range (HDR), like many TVs currently on the market, for the most clear and amazing picture possible. Additional features include120Hz refresh rate which allows for fast moving action scenes to be seen with virtually no motion blur, in addition to 3 HDMI inputs2.0 with HDCP 2.2 (one with HDMI ARC), 1 USB (media player), RF, Composite, Headphone Jack, Optical Audio Out, and Ethernet. For the TCL to be so reasonably priced (only $350.00 on Amazon), the picture is very high quality; it is also incredibly easy to set up and navigate as well. The warranty for the TCL is a bit dismal, so be aware; if your TV comes damaged (which this has happened before) it may be a pain to get someone on the manufacturer’s side to take care of the problem. No, you are not seeing double- we reviewed a similar Samsung TV a few TVs ago; this particular Samsung is an extreme step up, in terms of color, with a billion more shades than regular 4K UHD. It comes with four HDMI inputs and three USB ports, with the viewer being able to see extreme contrast between the darkest darks and the lightest lights, plus expanded color and depth while watching your favorite shows. Be prepared to enjoy smooth, crisp action, even in the fastest scenes, bringing sports and fast-moving content to life. And while we’re talking about it, please note the differences between the MU8000 and the MU800D. MU8000: Gray cabinet, 500 nits HDR sustained brightness, Mega Dynamic Contrast MU800D: Dark Titan cabinet, 470 nits HDR sustained brightness, Ultra Dynamic Contrast (just so you are aware). The picture clarity is absolutely amazing, with life-like pictures on even the darkest of scenes; the price isn’t TOO shabby ($650.00 on Amazon) and it definitely seems to be worth it. Also, as crazy as this may sound, the remote for this TV is incredible! It fits perfectly in your hand and has distinct, but easily recognizable buttons, and easy to navigate. The main complaint for this TV is that sometimes the apps can get “stuck” if you are trying to do too much at one time so just be mindful of that. Are all smart TVs compatible with wall mounts? Typically, most TVs on the market today are compatible with wall mounts, but just because they CAN go on a mount does not necessarily mean that they SHOULD. Just make sure that you read the description and capabilities thoroughly prior to purchasing. Are these TVs equipped with a game mode? Yes, they are and they are compatible with just about any gaming console that’s on the market right now (PlayStation, XBOX, etc.). You just may have to do some minor tweaks depending on the console that you are using. All in all, I would say to go with the Samsung8000, if you don’t mind spending a bit extra; if you are watching your financial waistline, go for the TCL which is pretty good, despite it being cheaper than the others.